Lions mane mushroom (Hericium erinaceus) is a medicinal mushroom and powerful superfood adaptogen for the brain, nerves and immune system. The mushroom looks quite different than other mushroom varieties. Instead of caps and stems they grow in globular masses and have long flowing spines. 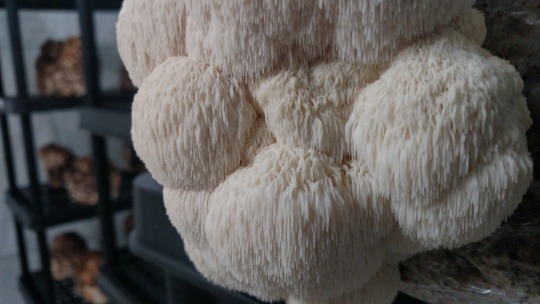 It gets its name from the white cascading tendrils that resemble a lions mane. This particular species is a parasitic fungus that grows hanging off of logs and trees, also referred to as hedgehog or bearded tooth mushroom. In Japan it is called yamabushitake or "those who sleep in mountains", referring to the Shugendo sect of "hermit monks" and their long flowing garments. Among all the medicinal mushrooms Hericium erinaceus is the top super mushroom for the brain and nervous system, hands down. We consider lion's mane the perfect superfood for those who have experienced seizures because of this ability to elicit nerve regeneration. It can be extremely helpful for those with epilepsy or who have experienced Gran-mal seizures, both of which are thought to cause nerve cell injury in the brain and affect cognitive function. Lions mane, like other medicinal mushrooms, contains high amounts of antioxidants, beta-glucan and polysaccharides that are made available when the mushroom is heated or prepared as a hot water extract. These health components are powerful immuno-modulators that support "deep immune health." Lion's mane is a potent catalyst for brain tissue regeneration and helps to improve memory and cognitive functions. Nerve Growth Factor (or NGF) is a protein that plays a major role in the maintenance, survival and regeneration of neurons. A lack of NGF is considered one of the major causes of Alzheimer's disease. It is required by the brain and important sensory neurons to keep the entire nervous system strong and healthy. Nerve growth factor is also known to stimulate and develop "new neuron growth" in the central and peripheral systems. In a 2013 study published in the Journal of Medicinal Mushrooms it states, " In conclusion, the aqueous extract of H. erinaceus contained neuroactive compounds which induced NGF-synthesis and promoted neurite outgrowth in NG108-15 cells." The mushroom was proven effective for its ability to efficiently stimulate neuron growth, improving muscle-motor response pathways in Parkinson's and repairing neurological trauma in stroke victims. In addition, lions mane mycelium has been studied to reduce amyloid plaques that interfere with brain neurotransmission. Amyloid plaques are clumps of beta-amyloid proteins, which originate in the fatty membrane surrounding nerve cells. When these smaller proteins break off they can block the signals between cells, which is thought to play a role in Alzheimer's and various neurodegenerative disorders, like Parkinson's. In addition to taking lions mane for neurological nourishment, we also suggest supplementing with an Omega fatty acid and DHA Omega-3 oil. This essential fat is especially helpful for proper brain and hormonal functioning that can work together with Hericium erinaceus to help repair damage in mild to extreme neurological conditions. We have come across some herbalists using lions mane, along with cordyceps mushroom and a host of other herbs, like astragalus, for the natural treatment of Lyme's disease. One such person is Stephen Buhner author of "Healing Lyme: Natural Healing and Prevention of Lyme Borreliosis and Its Coinfections." More research is underway about lions mane and its effectiveness as a treatment for helping to eliminate the spirochaete bacteria in the brain. This treatment of course goes along with an implemented herbal regime for the immune system. Is Lions Mane Mushroom Good for Depression? Yes, lions mane can be good for depression. Some people are calling it the "smart mushroom" for its possible effects on increasing cognition functions, memory as well as its potential as an antidepressant. Nerve Growth Factor is thought to play an important role in helping to elevate ones mood, alleviate anxiety and lessen the chances of depression. But in other studies it was also found that "HE intake has the possibility to reduce depression and anxiety, and these results suggest a different mechanism from NGF-enhancing action of H. erinaceus." (Nagano et al. 2010). We found this lions mane growing on the shady slope of an oak tree. It turns an orange color after it has spored. Lion's mane can be helpful for problems of the digestive tract such as stomach and duodenal ulcers, as well as for cancers of the esophagus, stomach and duodenum. The Chinese, who have been using the mushroom for hundreds of years, particularly note its benefits for various stomach ailments, including ulcers and gastritis. Gastritis is an inflammatory condition and irritation of the stomach lining. Hericium erinaceus is known to act as a anti-bacterial against the Helicobacter pyloribacteria that causes gastritis and peptic ulcers. Interestingly, the mushroom extract is approved by the Chinese Ministry of Health for Chronic Superficial Gastritis treatment. In Traditional Chinese Medicine it is considered good for five of the internal organs as well as for its benefits at activating digestive functions. Its digestive tonic effects are most likely due to the present of beta glucan polysaccharides, along with polypeptides and fatty acids. These substances also enhance the function of the gastric mucus barrier, important for a healthy colon and digestive tract. Research has shown that these polysaccharides, along with adenosine and oleanolic acids, stimulate the induction of interferons and modulation of the immune system. This in turn boosts the white blood cell count and helps to heal stomach related conditions.